The history of Sasando based on the narrative from the people in Rote island where it's started by a young man named Sangguana. One day he went to savannas and when he tired, he stopped to take a rest a while under the palm tree. Inadvertently, he slept and he was dreaming play a musical instrument from palm tree and next, the dream was inspiring him to create traditional musical instrument, known as Sasando. 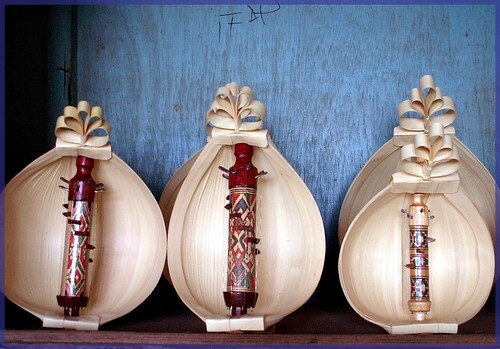 Sasando is typical traditional musical instrument of Rote island, East Nusa Tenggara. In Rote island, the term of Sasando is always called sasandu where it means an instrument that can vibrate and beep, while in Kupang called as Sasando. The way to play is by plucked. The materials to make Sasando take from dried palm leaves, bamboo, except the strings that made from filament. At a glance, the form of Sasando is similar to another plucked musical instrument like violin, guitar, and lute but the uniqueness is Sasando has different typical euphony. Why? Beause of sasando made from bamboo where the main body is shaped become long tube and in the middle part of the tube is given circular wedge from top to the bottom part. The tube is placed in a place that made from the woven of dried palm leaves and formed become a half circle like a fan. Sasando is traditional musical instrument that should be kept routinely. The lontar leaves (dried palm leaves) should be replaced each 5 years because of its nature is easy to be overgrown by mildew. The palm tree itself has latin name of Borassus flabellifer or known as siwalan tree where mostly, the tree grows in East Java and eastern Central Java, Madura, Bali, West Nusa Tenggara, East Nusa Tenggara, and Sulawesi. The tree is used by citizen of East Nusa Tenggara besides as raw material of Sasando, it's also used to fulfill daily needs like material for making a fan, mat, hat, several kinds of basket, and woven clothes. Playing Sasando isn't really easy. You need the harmonization in feelings and technique so it'll create melodious tune. However, if you want to learn besides listen its melodious tune also you can contribute in preserving the art and culture of Indonesia. For you who already have basic skill in playing one of musical instrument like guitar, violin, bass, and many more, it's easy to make you understand faster, the way to play Sasando. In playing sasando, someone need skill in plucking the strings like playing a harp. However, Sasando is played by using both hands with opposite direction. This is so unique and different. When you play it, make sure that your right hand play the chord while your left hand arrange the bass and melody. In East Nusa Tenggara itself, Sasando is played for several reasons like entertaining closest family or people who in grief, as an accompanist of dance and traditional ceremony, greet someone important, or just as an entertainer musical instrument. Sasando consists of several kinds such as "Sasando gong" and "Sasando biola". "Sasando gong" is better known in Rote island, it has pentatonic tone and usually, it's played with gong's rhythm and sung by typical poem of Rote island. This sasando has 7 strings or 7 tones and now develop into 11 strings. Meanwhile, "Sasando biola" is Sasando that has evolved with diatonic tone. At a glance, the form of "Sasando biola" looks like "Sasando gong" but the bamboo's diameter is bigger. "Sasando biola" began to develop in 18th century. Why it's called as Sasando biola? Because it resemble to violin tone with 30 tones then develop into 32 strings and 36 strings. Beside of two kinds of Sasando that has explained above, there's also electrical sasando where it has 30 strings. This sasando is a development from "Sasando biola" that is given the touch of technology. It was created by Arnoldus Eden (the deceased), a Sasando musician. When the 50th anniversary of province of East Nusa Tenggara, on 20th December 2008, Governor of East Nusa Tenggara (at the time) gave a charter to Arnoldus Eden (the deceased) as a sign of his merit in creating electrical sasando and he also has been meritorious in preserving Sasando. Electrical sasando was created because of there is a disadvantage in traditional sasando where it can't be enjoyed maximally by the listeners because when you play it, your fingers is hindered by dried plam leaves as a voice container that encircle Sasando. Moreover, the melodious tone only can be heard by several people around the Sasando player. Different with traditional Sasando which mostly use natural material, electrical sasando don't use material from dried palm tree. It doesn't need resonance space so the sound isn't like traditional sasando but the direct sound can be enlarged through speaker or anything else. Now sasando has develop with various variation and number of strings. For all of you who want to travel into Province of East Nusa Tenggara or perhaps you live over there, use your time by learning and playing Sasando, it's very unique and interesting. The best choice to learn Sasando is by asking the indigenous people over there to teach you directly how to play Sasando. Another alternative, in Kupang city you can visit one of learning place of sasando, located in sub-district of Maulafa, regency of Kupang city, 200 meters from the back of church GMIT, BTN Kolhua, Kupang. You can contact Caro David Hadel Edon (081-236-946-03) or just visit the website at edonSasando.wordpress.com.